from 2000 lbs to 4400 lbs Max. Walking beam suspension are on big trucks, huge trailers and industrial machinery. They offer some great ride and load management benefit for those big vehicles. Yet, why should the big boys have it all? 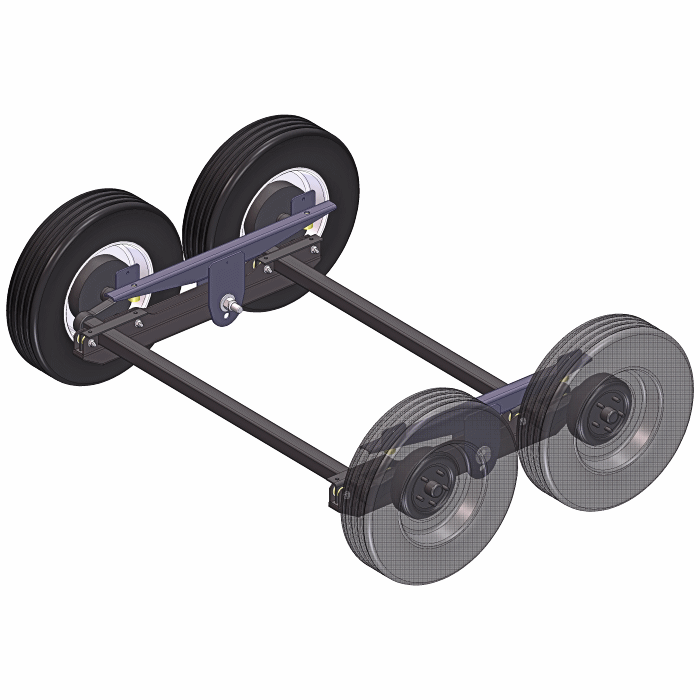 Here’s an innovative variation of the walking beam suspension — for smaller trailers — that goes one step further with torsion axles for drastically improved ride quality. These are the 2K – 4K plans. For heavier trailer please see the 5K – 8K plans. This design is NOT a trailer, just the suspension system for a trailer. Walking beam suspension has a pair of matching torsion axles giving a total capacity range from 2000 lbs up to 4400 lbs. Build it to meet your needs. Options are in the plans. The design adapts to trailers of most any width. It’s as simple as making the right offset. Formula is in the plans. 5″ axle step height differential — not including torsion arm suspension motion. It’s like 5″ suspension travel, but really it’s 2.5″ up in front and 2.5″ down in back (or vise versa). For a speed bump or pothole, it means the trailer only moves half as much as the bump is high. And really less than that with torsion axle compression action involved in the dynamics. The lower pivot mount allows 6″+ of axle step height differential. Some pieces are best cut via laser or waterjet. CAD files for those parts are in the download. 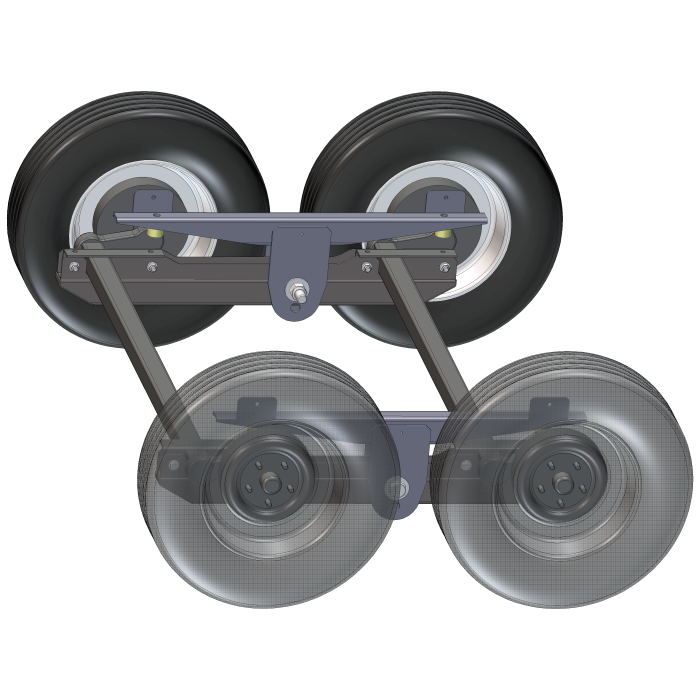 Height option has 2 mounting locations to adjust for trailer size, travel, ground clearance, and desired step height. 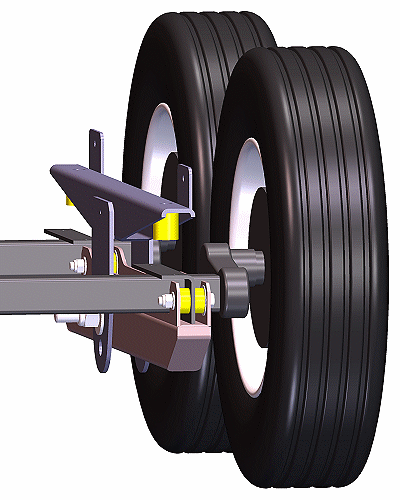 Plans allow torsion axles with various arm start angle options to give more ground clearance or lower trailer deck height. 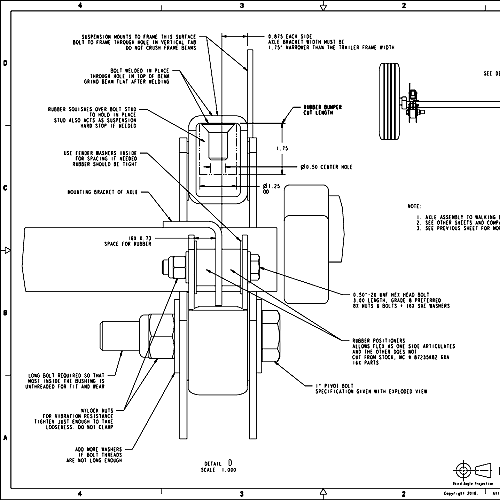 Plans include complete drawings and instructions as well as CAD files for the special parts. Download the whole package in a single .ZIP file. 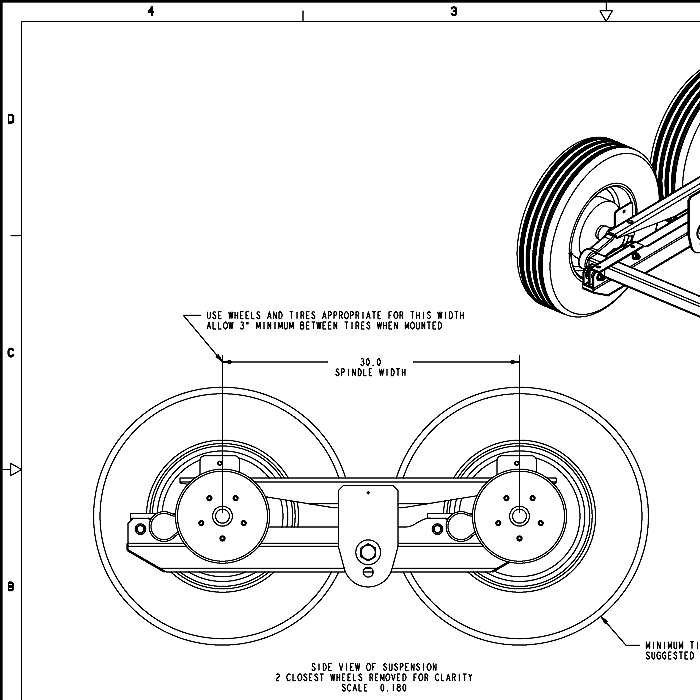 Bringing the benefits of the walking beam suspension to smaller trailers is the goal of this design. A 4000# trailer may not seem smaller, but compared to 60K or 100K, something to pull with a car is “smaller”. The walking beam suspension is complicated in some design aspects, but we’ve simplified it for DIY. Read about the design. Then, if you’re really interested in details, please read the Case Study for the Twin Torsion Engineering. Finally, you can see the suspension in action in this post and video. With lots of miles since then, the benefits are definitely worth it. Feel free to add this suspension to any of our 3500# utility trailers instead of the axle specified. Yes, they are strong enough to handle the added weight if you want and make them 4000# capacity trailers. The ideal ones are the 5’x10′ Utility Trailer, and the 6’x12′ Utility Trailer. The walking beam suspension has a lot of great benefits all by itself, but we went one step further. Torsion axles are great for a softer ride, but in a typical mounting — because they don’t load share. The walking beam, by definition, is a load sharing platform, so this design combines the benefits of torsion axles with the walking beam. This suspension is the result, and now you can build one too. The plans are Engineered by Synthesis, and they have already proven their viability. The walking beam suspension won’t conquer load distribution problems, but it will definitely smooth out the ride. Get yours and change the way your trailer tows. Construction Requires Metal Cutting, Drilling, Welding, Precision Setup and Some Outsourced CNC Cut Parts. Videos to assist with the setup and alignment are here to watch as well.